Jen and Tripp Davis’ new outdoor room features a fireplace, pendant lighting, and spots to watch TV, prepare meals, and dine casually. When their son, Owen, was accepted last year to the U.S. Naval Academy, Jen and Tripp Davis' finances became a little more flexible. They'd be paying college tuition for only one child, daughter Gwen, instead of two. "I told Owen he'd better do well `because we are using your college money for another purpose,' " Tripp says. 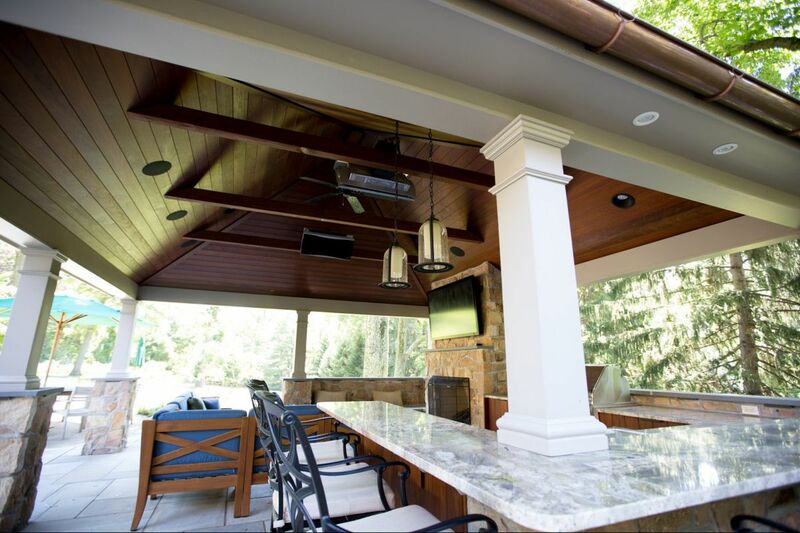 That purpose: adding an outdoor living room to their home in Rydal. Tripp, who owns a family-run manufacturing business in the area, and Jen, a retired accountant, had lived since 2001 in the house of more than 4,000 square feet. The flagstone dwelling, which they describe as a simple development Colonial, was not as light-filled as they would have liked — sunlight didn't really flow from the front of the house to the back. Jen and Tripp hit on the idea of an outdoor room, he says, after seeing one constructed by Bob Sadowl, a local contractor and landscape designer. They arranged for him to meet with their architect, Paul Macht, who had designed a 400-foot expansion of the house in 2001. Macht conceived the look of the outdoor space, which he says reflects pendulum swings in design based on technological changes in society. "In the past, there was no air conditioning, and people sat on their porches or on their lawns and got to know one another," Macht says. "Then, with air conditioning, people spend 90 percent of their time indoors." Ideas about indoor space are changing, he notes, and people want to spend more and more time "in outdoor spaces." The Davises' outdoor living room, completed in the spring, looks like a small freestanding palace. Its shiny copper roof is supported by stone half-columns set in flagstone bases. The room can be used eight months of the year, from March through October, Macht says. It includes a large flat-screen TV, a stove, and a refrigerator, as well as a sink and an ice server. For cool evenings, heating wires are embedded in the ceiling, and there is a huge stone fireplace. The room features a built-in table, and abundant, comfortable seats are arranged on the blue stone floor in front of the fireplace. The beadboard ceiling is ipe wood, a tropical wood Macht says has been certified as not having come from an endangered rainforest area. Even Chase, the family's golden retriever, was included in the new design: He now has a dog door leading from the kitchen to the yard. The new 260-square-foot outdoor space is visible from within the house through a large window that comes to a peak in front of the breakfast area in the addition Macht designed in 2001. The large, paned window illuminates the rear section of the first floor. A large master bath on the second level also was part of the earlier addition, and it, too, was topped off with a glowing copper roof. Outdoors, pendant lights provide illumination for the large island, which provides a kitchen workstation and a place for casual dining. One feature of the new addition is a small room originally intended as a closet. Jen has taken it over as a sewing room. She is currently working on a quilt for Owen made of T-shirts from the schools and camps he attended. Jen loves their new outdoor room. "It is wonderful," she says. "It is an improvement over last year, when we were about to rent a tent for the large party celebrating Owen's admission to the Naval Academy and, fortunately, it didn't rain, but we were prepared to have our celebration in a tent because there was nowhere else to have it."